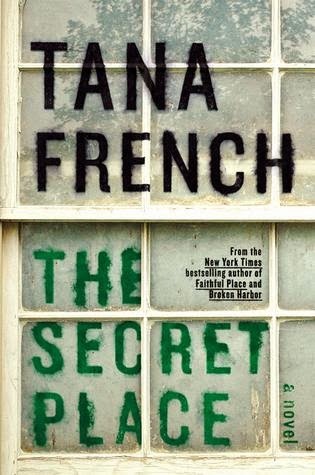 The Secret Place by Tana French is an amazing mystery that grabs hold of the reader and doesn't let go until the very end. I tend to be a slow reader, but I blew through this 450 page novel in just two days. I could not put it down. I sat up until 2:00 a.m. reading it until I literally couldn't keep my eyes open any longer. This was my first book by Tana French but it won't be my last, especially since I've seen several reviews by her fans saying this isn't her best work. The book alternates chapters between the present day and the months leading up to the murder over a year ago. In the present day, Detective Moran, who works cold cases, has teamed up with Detective Antoinette Conway, who is in the murder squad. He's hoping to get a foot in the door of the murder squad, but Conway isn't looking to make friends. They head out to Kilda's to interview the students and investigate what really happened the night Chris Harper was killed. The alternate chapters bring us into the world of Holly and her friends, who are extremely close, boarding in the same room and forming a very tight bond. Their rivals are another group of girls at the school, who also factor strongly into the storyline. One of my favorite parts of the book was the realistic way in which these girls all interacted and the relationships they formed with one another. The mystery was also well-done. I thought I had figured out who the killer was several times before it was finally settled. French did a fabulous job keep the detectives, and the reader, on their toes trying to solve the case. The only negative thing I can say about the book is that I generally don't like when books are written in a certain dialect, and this one has tons of Irish vocabulary that I stumbled over for the first few chapters. But once I got used to it, I didn't really notice anymore and it no longer distracted me from the story. Overall, The Secret Place is one of my favorite books of this year. If you're looking for an engaging mystery with characters that draw you into their world, I highly recommend it. It's the fifth book in the Dublin Murder Squad series, but it worked fine as a standalone novel. Connect with Tana French on her website or Facebook page. This review was written based on a copy of The Secret Place that I received from the publisher in exchange for an honest review. This post includes an Amazon Affiliates link. Sounds so good!! Definitely giving this one a try. So what Tana French novels did you hear were her best? Looking on Goodreads, one reviewer liked In the Woods best, which I know you didn't like all that much. A few others liked Broken Harbour best or said each one is better than the last. The detective in this one was evidently in Faithful Place, so I guess it might be best to read that before this if you're worried about spoilers. Of course, my review may include spoilers for that one since Detective Moran and Holly are both in it and obviously they survive. :-) I may go back and read that one, though, since I enjoyed these characters. Oooh! Such a favorable review! I really think I need to pick this one up. I'm itching for a good mystery, it's been wayyyy too long since I've read one. It's very good! Great characters! I've only read book 1 so far, but my husband is up to 3 I think. I need to get him the 4th for Christmas. This one sounds excellent! I found The Secret Place available as an audiobook and put it on hold. After reading your review I can't wait to listen to it.